Success doesn’t happen by accident. Not in your career. Not in your relationships. Not in any important area of your life. You’ve got to live with purpose and intentionality. If you don’t decide what to do with your life, someone will decide for you. And you probably won’t like it very much. Below is a growing list of awesome books, podcasts, and other resources that will help you live a life of purpose, prosperity and progress. Best Work/Best Life Podcast hosted by Kathy Caprino and Mo Faul. The show promises illuminating advice to build your best work and best life. Career coaches Caprino and Faul help working women navigate and conquer work/life issues. Though their message is geared towards women, the advice is relevant for men folk, too. The “Best Work/Best Life” Podcast is available on the Kathy & Mo website and on iTunes. This is Your Life Podcast hosted by Michael Hyatt. Michael Hyatt is a leadership expert, New York Times best-selling author, and, as he puts it, “your virtual mentor. Hyatt’s weekly show offers solid advice for growing your career, living with more joy, and focusing on things that matter. The “This is Your Life” Podcast is available on the Michael Hyatt website and on iTunes. The Smart Passive Income Podcast hosted by Patt Flynn. The podcast is an extension of Flynn’s wildly popular site about online business, blogging, and creating passive income. The “Smart Passive Income” Podcast is available on the Smart Passive Income website and on iTunes. If you’re like me you enjoy a good pithy quote. Here are some tasty quotes to nibble on. In case it’s not obvious, I am a ravenous bookworm. To be more specific I’m a ravenous bookworm with an insatiable appetite for personal development books. I can spot a good self-hep book, or a not-so-good self-help book, from a mile away. The books below are mental gold. Essentialism: The Disciplined Pursuit of Less by Greg Mckeown makes it painfully clear that when you say YES to things that don’t matter you necessarily say NO to the things that do matter. In Essentialism, Mckeown shows readers how to break away from the nonstop treadmill of life to pursue their most essential work. Essentialism by Greg McKeown is available in print and Kindle edition. The Power of Who: You Already Know Everyone You Need to Know by Bob Beaudine shows us that traditional networking is dead. While meeting new people and foreign new connections have their place, Beaudine’s book explains how to leverage your relationships with friends, family, co-workers, etc. These are not sleazy, take advantage of people tactics. It’s simply a matter of tapping into a group of people who already like you. The Power of Who by Bob Beaudine is available in print and Kindle edition. Where is God When it Hurts? by Philip Yancey asks the hard questions: Is there a loving God? Does God specifically send suffering to certain people? Why does He seem silent at times when His presence is needed the most? Whether you are a believe or not, this book will challenge your thinking on pain, suffering, faith and hope. Where is God When it Hurts? by Philip Yancey is available in print and Kindle edition. 48 Days to the Work You Love by Dan Miller (and Dave Ramsey) makes an enticing proposal–you can do work that sets your soul on fire without becoming a starving artist. The book is loaded with techniques for finding and creating work you’ll love in just 48 days. 48 Days to the Work You Love by Dan Miller is available in print and Kindle edition. 48Days.net is for anyone who wants to earn a leaving doing work that they love. You’ll find experienced and aspiring writers, coaches, speakers and entrepreneurs. The message boards are active and completely free to post questions and get feedback. Join the 48days community today. The Freelance Writer’s Den is dedicated to helping writers earn a living writing. Den Mother Carol Tice gives members access to weekly teleconferences, free books, industry expert advice, and a private message board where aspiring and seasoned writers share ideas, give feedback, and celebrate writing achievements. 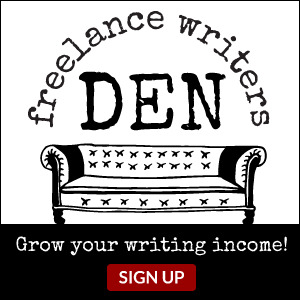 If you want to e a six-figure writer, check out the Freelance Writer’s Den. Udemy is an online platform that allows users to take courses on a variety of topics from marketing to needlepoint, from how to jumpstart your blogging career to how to raise grateful children. It’s all self-paced and some courses even offer discussion groups and instructor feedback. I probably heard of Udemy four years before I took my first class. My hesitation was three-fold. Why is Udemy so expensive? Doesn’t Udemy let anyone teach a class? And what if I flake out and don’t finish my Udemy course? When I received a promo code to take any class for $10, I had to give Udemy a try. I’ve been gorging on a buffet of personal development courses ever since. You can read more about my Udemy obsession later. Check out these top-rated Udemy courses for personal development. Always check around for the Udemy promo codes. Disclaimer: I hope that you found the above references helpful. Do note that I am an Amazon affiliate (and likely a future Udemy affiliate). This means I earn a small commission when you make purchases using my links. It won’t cost you extra. I’ll have absolutely no idea what you purchased. And I’ll love you forever for your support.